We are women - we love food; what more can we say? Seriously though, we know we are coming to be spiritually nourished but some physical nourishment and the time to visit and connect with the other sisters is really important too. Providing the Friday meal as part of the conference package saves time and lessens the dispersment of participants during the lunch break. It is an important part of the schedule that allows us to finish early enough so that sisters can attend the temple Friday night. 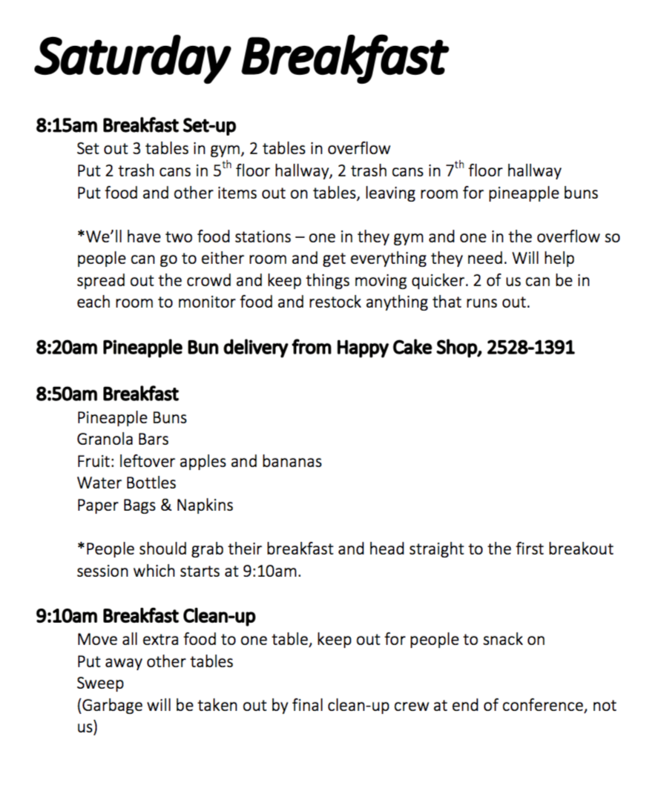 The Saturday morning "breakfast on the go" was added in 2013 in response to sisters' requests on that morning when we begin the sessions early. It is also a positive "social" addition to that final morning that we are together. "Thank you for the opportunity to participate in this conference. It was impressive and so well organized! At first the food task seemed overwhelming but it was very easy to follow the information from the year before and I had a great committee! Thank you also for all your advice, direction and support"
contact caterer/restaurant with preliminary order numbers (based on previous year) and establish procedure and deadline for final order numbers as per their needs. 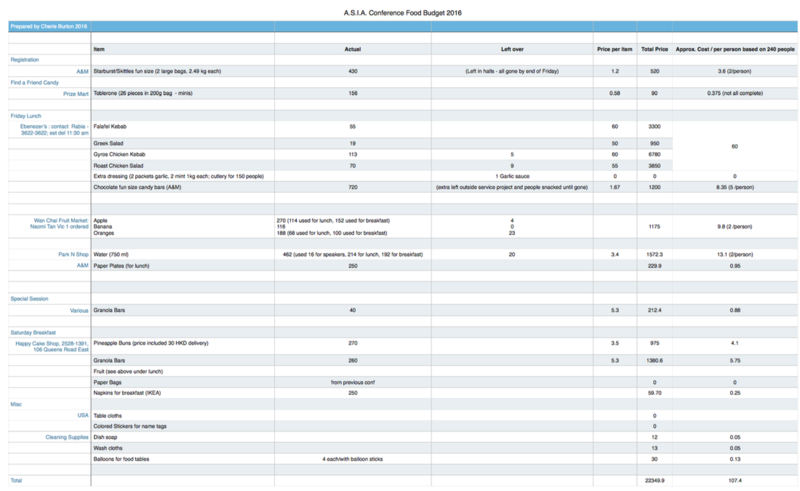 Confirm additional set up and clean up help Names can be sourced from online registration - contact committee or registration chair for this information. Discuss with committee Chair and Co-Chairs the plan for food for the committee on Thursday and Saturday. Place orders with caterers and vendors - the registration chair will have final numbers for you from the online registration. 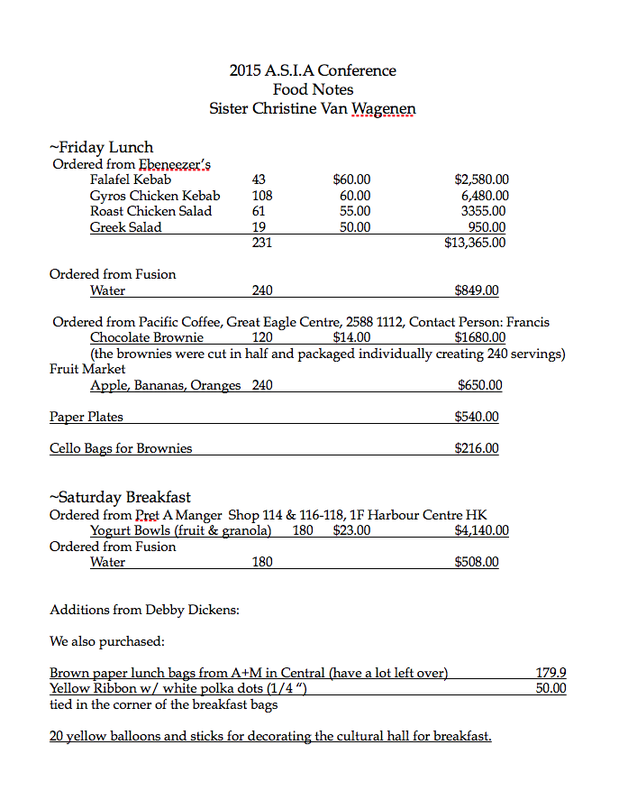 Order food for the committee for Thursday and Saturday. email reminder to sisters who have signed up to help. Delivery of items to church - inform delivery people and guards to put items in the 1F kitchen. 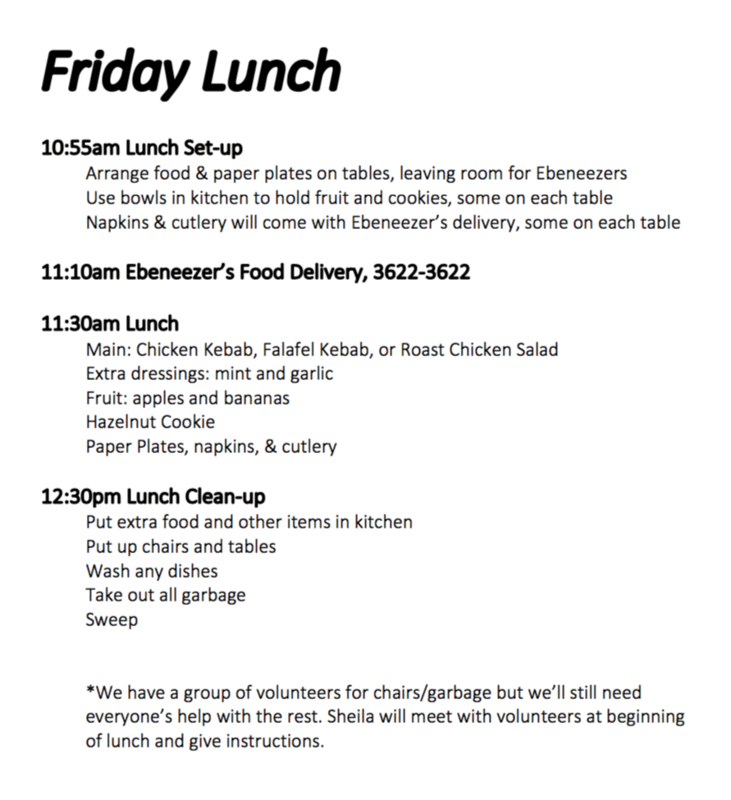 help set out the lunch as it is delivered. ensure garbage cans are emptied as needed to avoid overflowing. Remove trash to dumpster in church parking garage. Clean up lunch including washing tables and any dishes used. Sweep floor. Set up breakfast 'on the go' in areas as directed by the committee. (*2014 it was served in the overflow and cultural hall next to the 1Fl chapel. 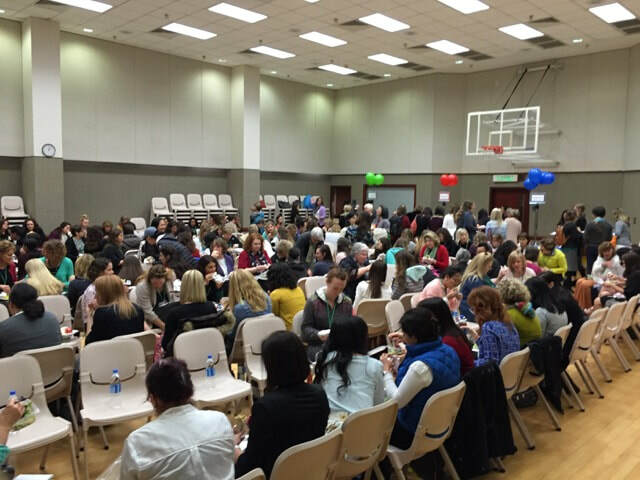 2-3 long tables allowed easy flow as participants exited the devotional on their way to classes). Cover with cloths until time to eat. 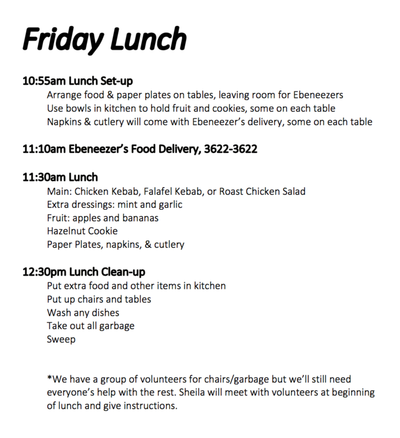 Clean up - have pre-assigned sisters to help clean up tables and any left-over food from kitchen. Additional Helpers before and during conference: Naomi Tai (fruit purchase), Lauren Chow from Shamsuipo Ward (ckylwahaha@gmail.com) who helped set up the gym. *The assorted Merci Petits were popular. I basically doubled the number of chocolates based on Kelsey Christensen's advice from last year. *Color-coded stickers on the back of attendees' name tags helped make lunch go smoothly. * Stickers were put directly on the back of name tags not on the plastic holders of the lanyards so they could be easily reused next year. *Cherie Burton prepared the exact numbers of stickers for the meals attendees had ordered. The 8 extra meals' stickers were kept separately to help keep track of the meals. *Naomi Tai helped us order and deliver the apples and bananas. *Lynda Strafford helped us order the bottled water. She ordered the bigger bottles(750ml) because they were actually cheaper than the smaller bottles. *I ordered the meals from Ebeneezer's 4 days in advance. They were very thorough, helpful and punctual. *We set up the gym basically like the year before. We had about 160 chairs and about 80 in the overflow room, making sure that people ate, facing other people not furniture or the wall. We also created wide paths leading to all three food stations. We tried to have some aisle space by not having very long rows of chairs. 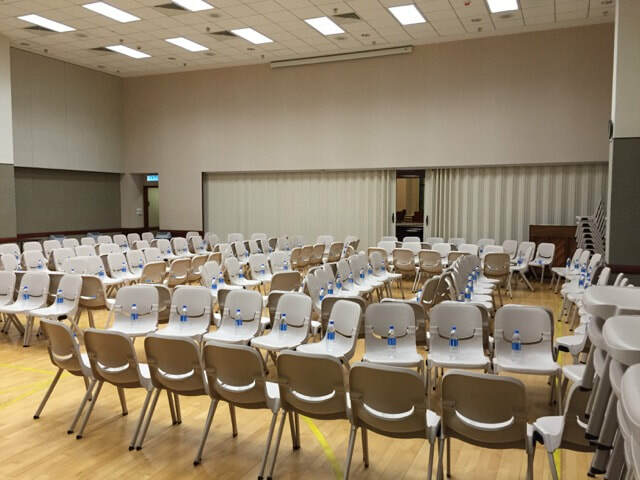 *Water bottles were placed on the chairs like the previous year. *We had the folding door between the gym and chapel open for easy access to the overflow room and gym. *We had 3 trash cans with tops off by the gym exit with extra garbage bags handy and one in the overflow room. It was adequate and the clean-up crew attendees were very proactive in emptying the cans and stacking up the chairs at the end. *We also set up the first floor overflow room for extra seating. We put up signs to direct people to it. We assigned a particular color for the name tag stickers/balloons/tablecloth to each lunch option. We used the sign posts on the left of the security guard desk on G/F for the food signs and balloons to be placed next to the long food tables. 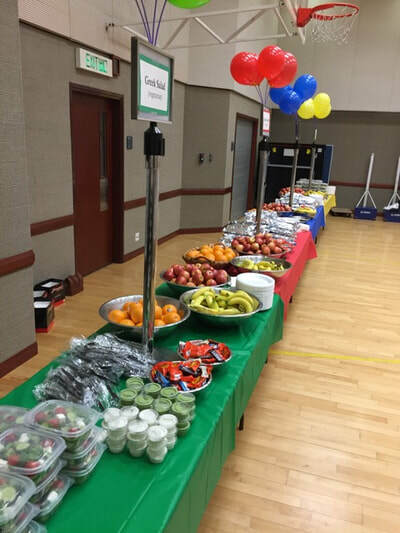 * Before Ebeneezers arrived, we had put the fruit, candy bars and mints on the tables/stations. *38 people indicated that they would help clean up when they registered online. 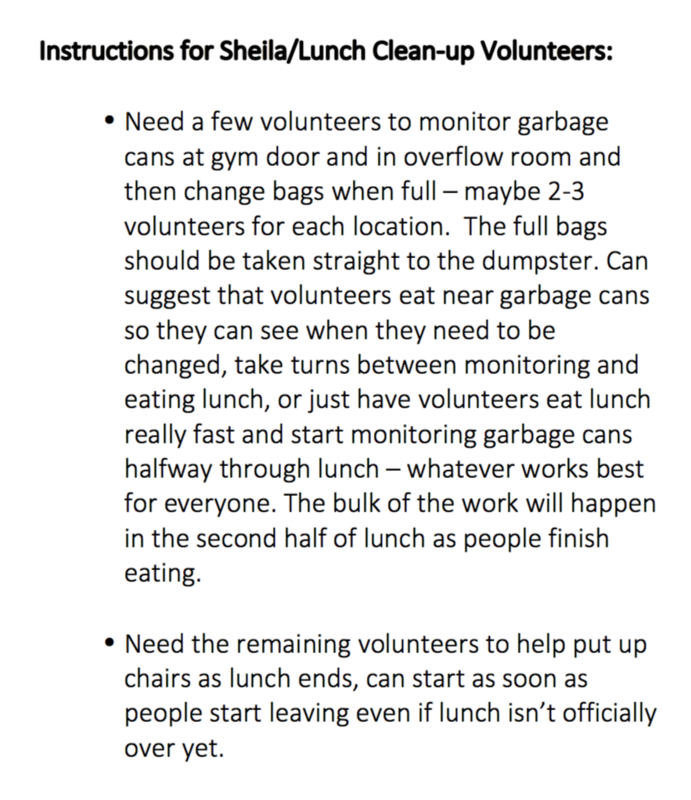 I sent them an email letting them know what we would need help with(specific tasks like stacking chairs, garbage bags) and thanking them for volunteering before the conference. We didn't really need to assign them any specific tasks on the day. Once they were done eating, they went right to work. Clean-up was smooth and quick. 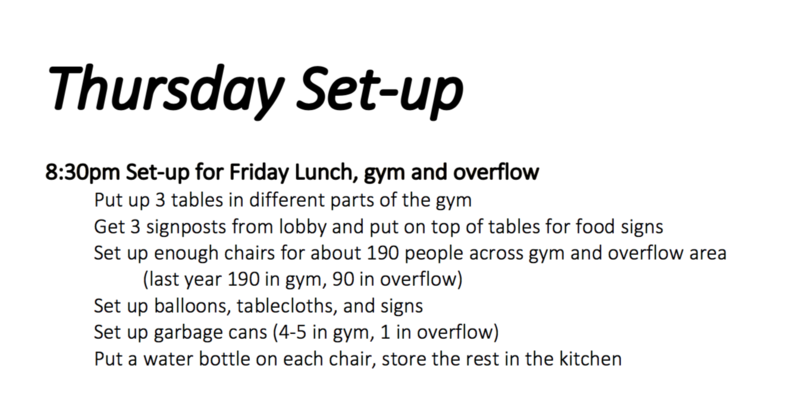 *We set up 3 tables in the center of the gym and one in the 1/F overflow room. *No need for setting up chairs. *Fruit, water bottles, paper bags were placed on the tables before Pret breakfast arrived. *I ordered from Pret A Manger online 3 days in advance and it was easy. *Breakfast went smoothly as well. NOTE: The red, yellow, and green tablecloths probably got tossed during Friday lunch clean-up. They are gone! The following photos show how we set up the gym for Friday lunch. We did not buy enough registration candy this year. We bought enough for roughly two per person, but ran out before everyone had registered. I’d suggest chocolate again but buying double next year. Colored stickers worked well for lunch again. Registration people reminded sisters what they had ordered when they got their name tag and gave them the corresponding colored sticker to put on their name badge (some put in back, some in front - not sure if it matters aside from reminding them what they had reserved). Gave Registration the exact number of stickers in each color so that it was easy to identify how many of each lunch was ordered and what was left after registration to give to walk-ins. We ordered 10 extra meals above the 185 ordered during online registration (total participants was 238 but about 40 of those were Filipino sisters who could only attend Saturday and therefore didn’t need the Friday lunch. Several more people opted for no lunch). I included the corresponding colored stickers for these extras but didn’t physically separate them from the others of the same color. It would be more helpful to Registration committee if the stickers for the extra lunches ordered were separate from the stickers for the actual number for lunches ordered. DO NOT FORGET TO PROVIDE REGISTRATION THURSDAY NIGHT WITH A LIST WITH ATTENDEE NAMES AND WHAT LUNCH THEY ORDERED. I forgot that this year and it made for a semi-chaotic registration process with us trying to access the info on our phones. I had each committee member/Helper take care of one major food item (ordering and making sure it got to the church on time after I gave them the final numbers so I didn’t have to think about it) then I took care of all the rest. Sydney – water, Kelsey – granola bars, Sheila – pineapple buns, Naomi – fruit, Betsey – Ebeneezer’s. I took care of all the extra candy, paper products, Thursday and Saturday extra meals, etc. This worked out nicely. I don’t think anyone felt too overwhelmed. Even though Naomi wasn’t on my committee, she offered to do the fruit because she’s done it in the past and knows the wholesale fruit market well. Betsey was the Co-Chair over me but took over for a fourth committee member I had that eventually felt too overwhelmed with the Ebeneezer’s order. My food committee members helped with all set-up and clean-up. We set up the room differently this year and received tons of good feedback. We had 3 tables, one for each lunch option, set up in different corners of the room (the corner by the entrance being the one corner not used). We had fruit, cookies, plates, and napkins for each table. Colored table cloths corresponded to meal color stickers. 3 sign posts from lobby (picked up from little corner by main building entrance) were placed on the tables with signs indicating lunch option. Color-coordinated balloons were attached to the signs to make lunch options even easier to identify. 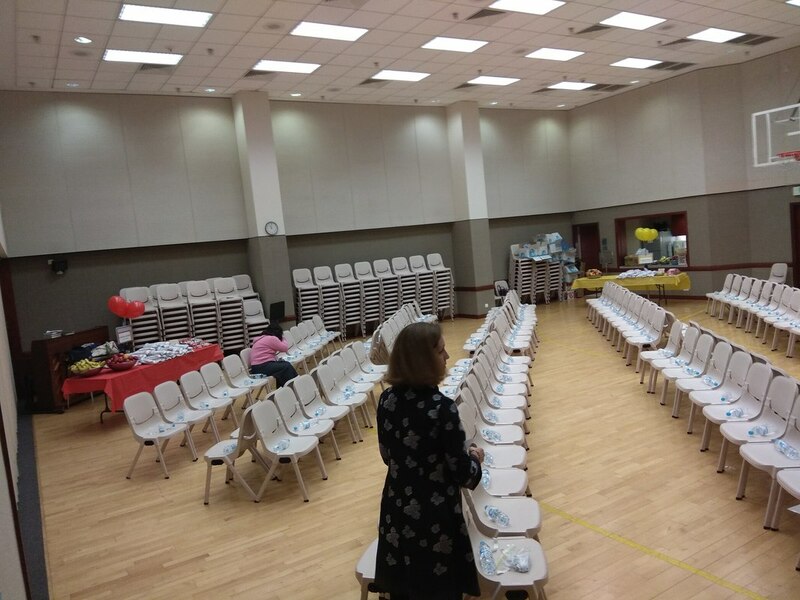 We set up the chairs in straight rows with chairs sitting back-to back, but left one large aisle going diagonal from gym entrance to back corner where the kitchen and one of the food tables was located. Also left enough room for people to walk around edges of gym – this allowed people enough room to get to other food tables from the gym entrance as well. Waters were set on chairs prior to meal service. 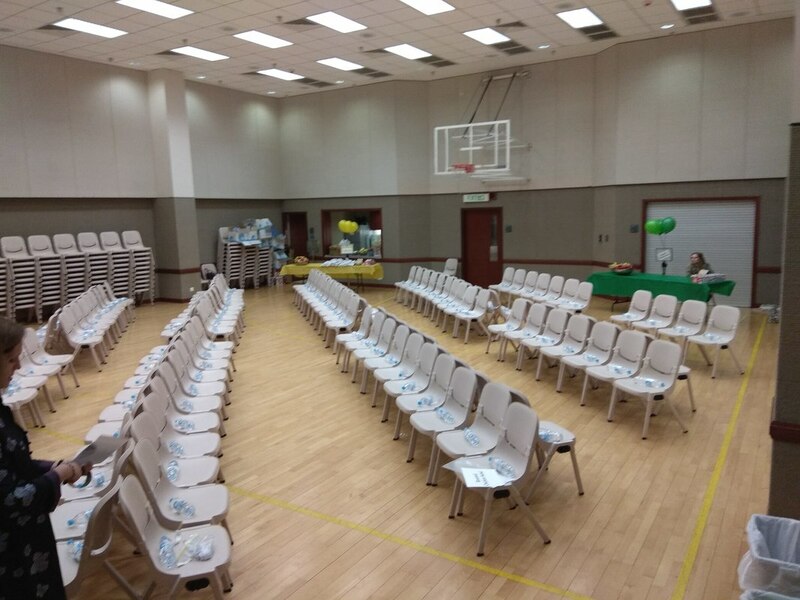 Even though we only expected about 180 for lunch, we set up 130 chairs in the gym, 80 chairs in the overflow. The gym can definitely hold more chairs than 130, but we wanted to keep the gym a little less packed than last year (did 190 chairs in gym last year) to help with flow and not feeling as cramped. Most people still ended up sitting in the gym. Once most people had gotten their lunch, we didn’t need as much space and people started pulling down extra chairs for more seating in the gym. We taped up signs and arrows directing people to the additional seating in the overflow. Had one food committee member at each food table monitoring the flow and stock of food items. 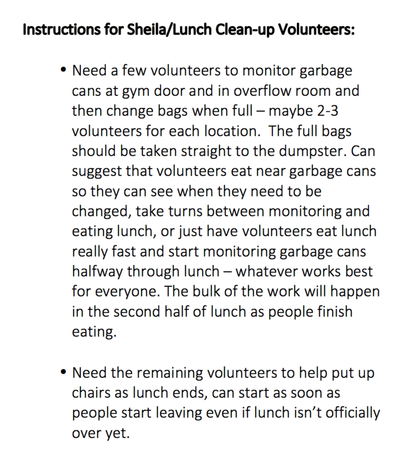 Another food committee member was in charge of organizing and monitoring clean-up volunteers. I floated and kept an eye on the overall lunch, helping where needed. We opened up the curtains between gym and chapel to allow more access to gym. We had about 40 volunteers for helping lunch cleanup that came from the registration form. 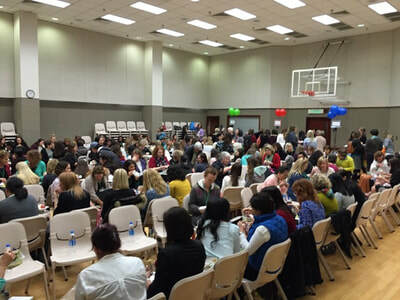 We emailed all the volunteers a few days beforeconference thanking them for their service and asking them to meet Sheila in the gym (in the back by the kitchen) for a 5-minute meeting at the start of lunch. An announcement with this reminder was given verbally during the Friday opening session as well. About 25 people showed up. Several volunteers were assigned to monitor trash cans in the gym and overflow, change bags when full, and take full bags down to dumpster in parking garage. Remaining volunteers were asked to help pick up chairs as people started to finish lunch. This worked really well. 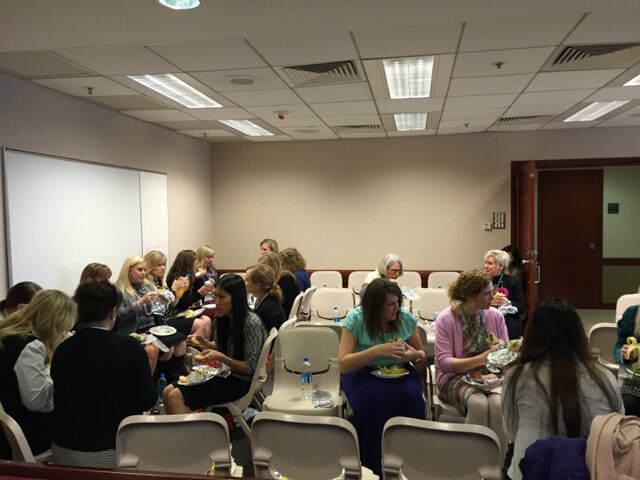 We had all the chairs picked up and garbage taken out before the first post-lunch breakout session even started. Volunteers didn’t have to miss any of the session. Placed 4 grey trash cans along wall by entry door in the gym, 2 in overflow room. Unlike last year, we put signs on the wall labeling the trash can area which people liked. We had an unusual number of people complain about that the year before. We did not offer the Greek salad option this year. In 2016, very few people ordered it is those who did were still hungry after.No one said anything or seemed to miss it this year – the falafel kebab was a good vegetarian option. Breakfast was served on a total of 4 tables – 3 in the gym and 1 in the overflow area. Each table had pineapple buns, granola bars, fruit, napkins, plates, and water so that people could go to any table and get everything they needed at just one table. We moved all the food to one table after everyone had gone through the lines and anything extra was more or less eaten by the end of the day. Pineapple buns are easy but I wouldn't recommend doing them again. They are just too messy. It was the headache for the final clean-up crew to have to vacuum up all the crumbs. I’d still recommend a bakery item that you can have delivered that morning, but I’d suggest doing a different kind of bun – maybe the cocktail/coconut bun or something similar. This year for the first time, we provided a light dinner for the organizing committee Thursday evening just because it’s a long day of set-up and it goes late. I went to a Subway close to the church and brought back food at 6pm. I put it in the 4th floor kitchen but next year I would just put it in the committee room on the 4th floor. We had 6, 12-inch ham/turkey subs cut into thirds, and a dozen cookies. Also for the first time this year, we provided pizza for the Saturday cleanup crew and committee chairs. We expected bout 30 people so we ordered 2 large pizzas from Paisano’s and had it delivered to the 4th floor kitchen at 1pm. We ordered one cheese and one pepperoni and had them square-cut so the pieces were smaller. I had to leave before everything was over but I assume it was all eaten. 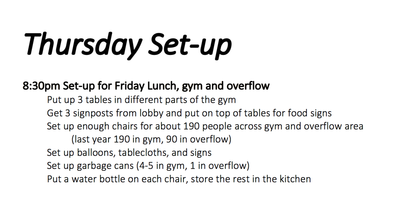 The diagram we used to set-up the gym for lunch. The trash signs we used. We glued them to larger colored cardstock and hung them above the trash areas in the gym and overflow. Wednesday: Deliver any purchased items to the 1st Fl kitchen - Lockup! - Get money for Ebeneezers payment at end of registration. Make bank transfer. Colored stickers worked well for lunch - people liked not having their name say “falafel kebab” if their name tag flipped over. Registration reminded the people what they ordered when they got their name tag and gave them the corresponding colored sticker to put on their name badge (some put in back, some in front - not sure if it matters aside from reminding them what they had reserved). We did not check sticker color when they picked up food - used honor system and worked fine. Important to let registration have the exact number of stickers in each color so that easy to identify what lunch was reserved to who and also differentiated from the walk -ins who were seeking food (they didn’t have a sticker). We ordered 9 extra meals above the 235 ordered during online registration. The corresponding stickers for these extra were given to registration the Thursday night to hand out to walk-ins. After 20 walk-ins Thursday night, we increased our order by 13 additional meals by calling Ebeneezers that night. Next day we announced that there would be extra meals during opening session and for those who were interested to meet a committee member in the hall. Once majority of those who had ordered meals had gone through the food line we allowed the extra people in. Turned out that we netted 9 extra meals. Ebeneezers had us deposit half of money in their account night before. Emailed them a copy of the bank transfer before 10pm. They provided extra dressing, extra plastic utensils and napkins for free. Ended up with 1 extra packet of garlic. Packet size was 1 kg. Room set up - 4 long tables along kitchen wall each designated with one type of meal. Also had fruit, candy plates and napkins for each table. Colored table cloths corresponding to meal color stickers. 4 sign posts from lobby by building entrance used on table with cards indicating the item at that table. Chairs grouped around room - used chair backs to guide people in a line to the food. Waters were set on chairs prior to meal service. Gym held 190 chairs, overflow 90 chairs. Eliminate Greek Salad option if using Ebeneezers in the future - too few ordered and those who did were still hungry after. Falafel kebab is a good vegetarian option. Breakfast was served on a total of 5 tables - 3 in gym for food / 1 for water, 2 in overflow area. Breakfast change to pineapple buns were well received! The bakery delivered on time individually bagged and hot. We ordered to the registration number (240) and did have extras, however all the extras were eaten before the end of the conference. We left the extras in the gym and people liked that if they were still hungry, having the option to go there and get an extra bun, granola bar or piece of fruit. At the end only remaining food items were ~20 waters, 23 oranges, 7 granola bars, and 4 apples. In the past, my understanding is that breakfast was always ordered to be less than the registration number due to an expectation that some people won’t attend the breakfast (which did happen). However, I had a hard time justifying not ordering meals for people who had paid and were told there would be one there on the chance they weren’t. The extra breakfast items were more or less all consumed by before the end of conference and were very appreciated by those who were still hungry. My recommendation would be to order to the pre-registration number and share the extra breakfast in the gym. Since this is not a for profit event and the cost is covered by registrants it seems to me to be the right thing to do. 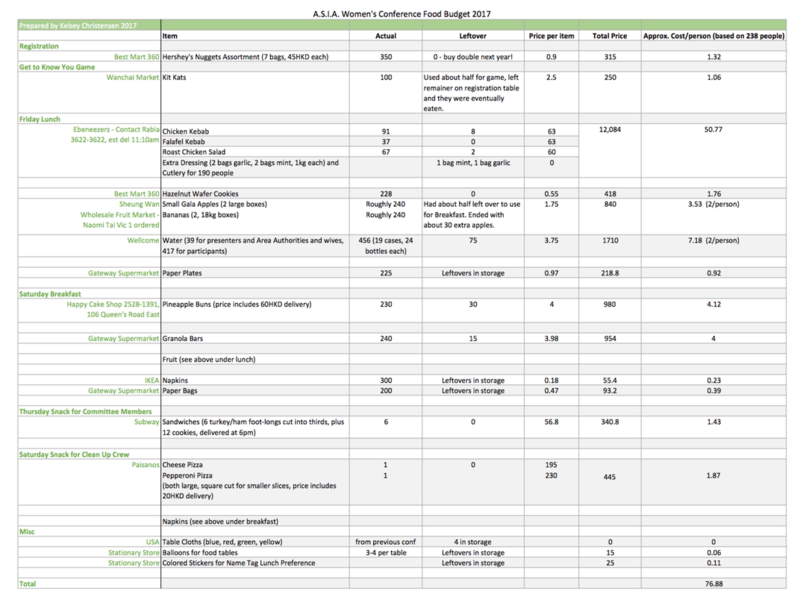 To download a pdf version of the Food Budget document below, click here. 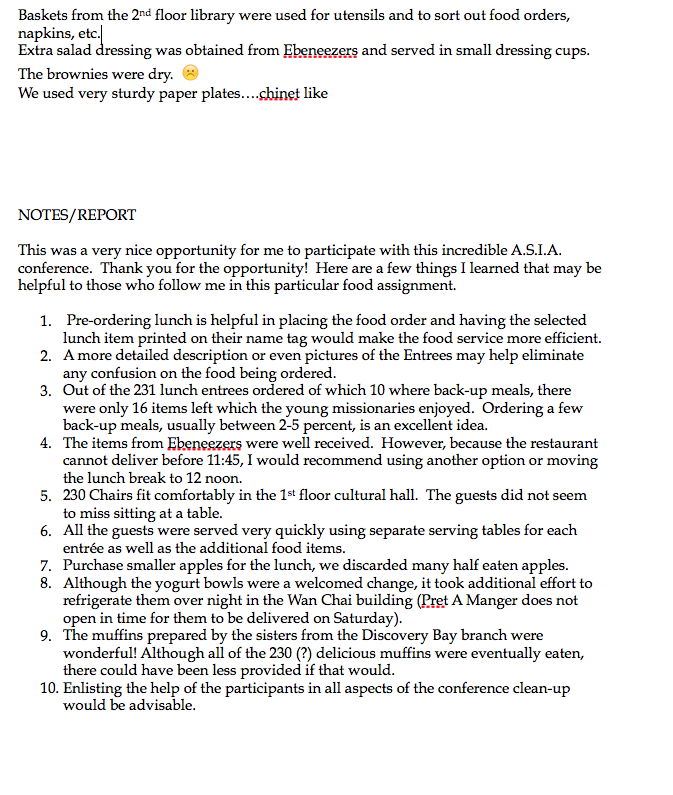 17 indicated no lunch on Friday, so that is 195 orders. 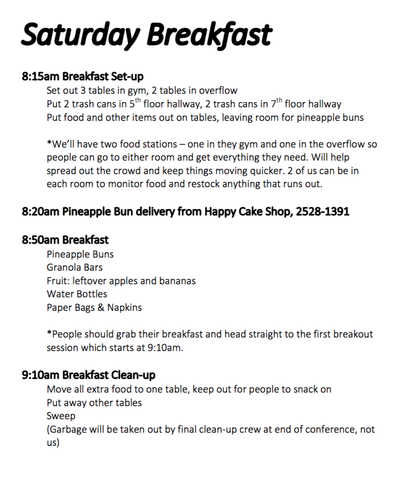 We order just a few extra meals to accommodate those who register as 'walk ins' at the conference. 11 indicated no lunch Friday.